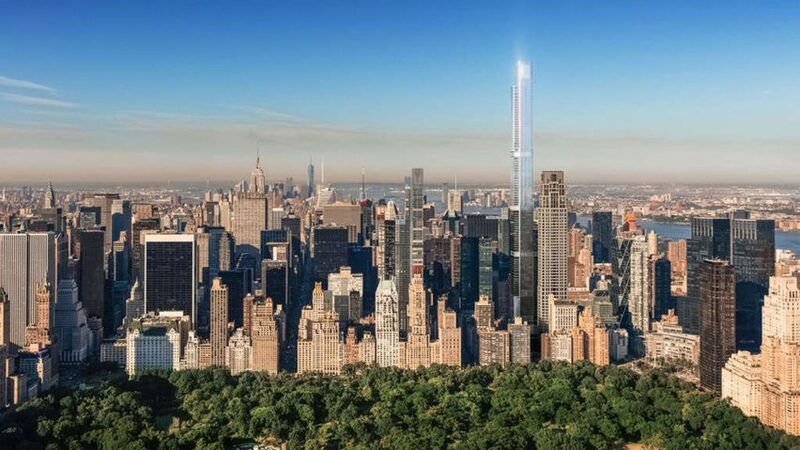 New details about the future tallest residential building on Earth have been released, along with an updated rendering showing the supertall skyscraper towering over New York City. Sales of the ultra-high-end residences at Central Park Tower are slated to commence imminently, as the structure continues to rise at 225 West 57th Street. Designed by Adrian Smith + Gordon Gill Architecture, the skyscraper is expected to reach 1,550 feet (472 metres) tall when it completes in 2019. Floor plans and interiors revealed in preliminary marketing materials show expansive apartments decorated with rich materials and glossy finishes. Prices for the residences will average $7,106 (£5,515) per square foot, while one of the units will be listed for $95 million (£74 million). A flagship seven-storey Nordstrom store will sit at the base of the tower, with a hotel above and the condos occupying the higher levels. Amenities for residents will include a cigar bar, a private dining room and a grand ballroom, along with conference suites, children's play areas and a screening room. The new exterior rendering released by developers Extell – obtained by 6sqft – shows the glass-clad building soaring above Midtown Manhattan, but leaves out neighbouring giants 432 Park Avenue and 111 West 57th Street. These luxury condominium buildings are lie along a stretch of West 57th Street now known as Billionaire's Row. They fall under the category of "supertall" – measuring between 980 feet (300 metres) and 2,000 feet (600 metres). The Rafael Viñoly-designed 432 Park Avenue currently holds the title of world's tallest residential building at 1,398 feet (426 metres), but Central Park Tower will eclipse this by over 150 feet (46 metres). Meanwhile, the future looks uncertain for SHoP Architects's skinny supertall, which is currently stalled at 20 storeys tall due to ballooning costs. Chicago firm Adrian Smith + Gordon Gill Architecture is also set to make records with its Kingdom Tower in Jeddah, Saudi Arabia, which is planned reach over 3,280 feet (1,000 metres) high – overtaking Dubai's Burj Khalifa as the world's tallest building. However, Adrian Smith told Dezeen in a 2016 interview that "conflict and financial turmoil" will stall megatall skyscrapers, despite technological advances.